I want to thanks the great folks at Bonhams (Rubert and Samantha) for giving MegaDeluxe the permission to show these large photos of the 1969 Velocette Thruxton. A gorgeous looking machine if there ever was one. 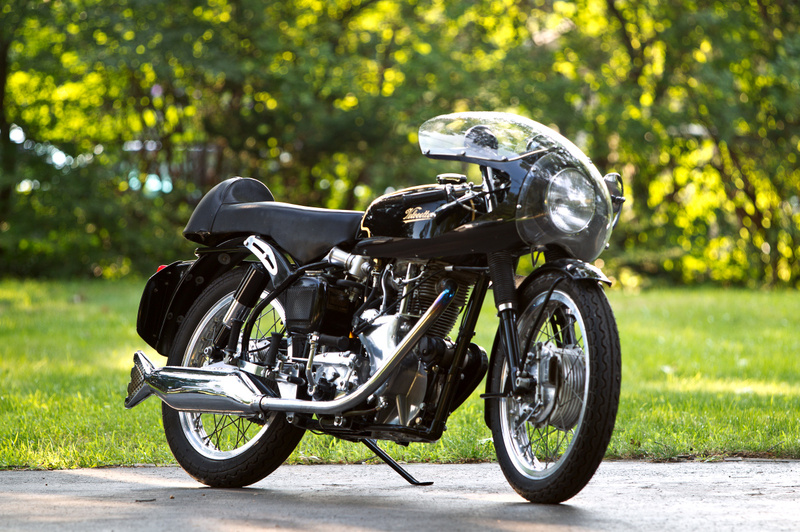 I also want to share (in full) the story of the Velocette Thruxton as written by Bonhams. 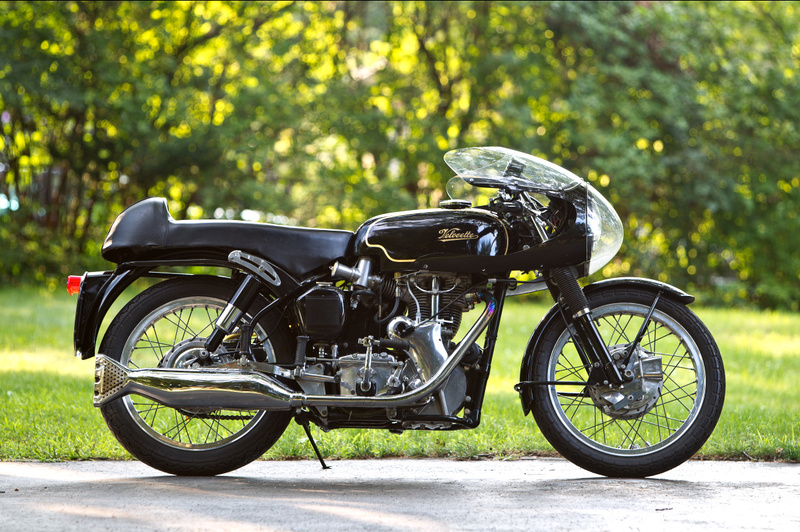 From Bonhams: It’s been called the last of the great British singles, outlasting the BSA Gold Star and Manx Norton by almost a decade. In fact, the Velocette Thruxton lived long enough to do battle with the first of the modern Japanese superbikes, though it wasn’t a long fight nor particularly fair. The Thruxton, with design roots that stretched all the way back to 1935, was gone for good in 1971 when Velocette shut down its Hall Green, Birmingham factory and quietly went out of business. 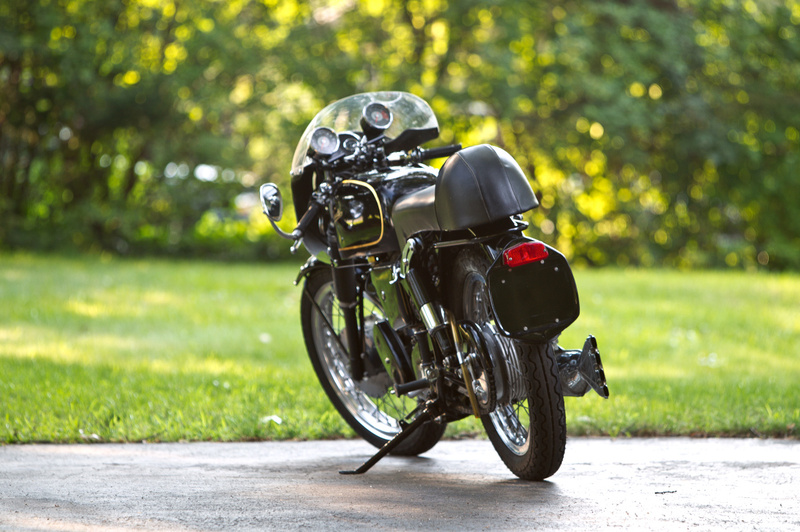 The Thruxton was a true factory-built cafe racer. Its immediate predecessor, the Venom, had already made a good name for itself in performance circles despite running an antiquated 500cc pushrod motor. In 1961 a works-supported team of riders set the world 24-hour speed record, and in ’64 another Venom took a class win at the Thruxton 500-mile endurance race, crown jewel of England’s popular and hotly contested Production roadracing series. That victory gave Velocette a great excuse to hot-rod the Venom and make the resulting 1965 Thruxton an even better race bike. Up front, the 8-inch brake was converted to Tickle twin-leading-shoe operation. Rearset footpegs gave greater lean angle. Clip-on handlebars got the rider down, out of the windblast and “under the paint.” Proper racers need proper lightweight wheels and the Thruxton got those in the form of Dunlop alloys. The engine was upgraded, too, with a flowed cylinder head, bigger valves and a downdraft intake tract. 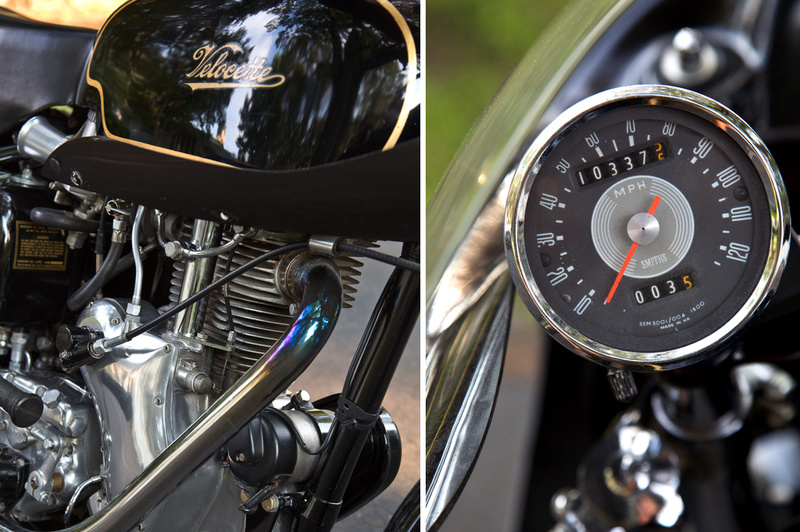 Working through a close-ratio gearbox, the Thruxton put out 40-41 horsepower, about 5 more than a good-running Venom. It did not take long for success to find the Thruxton. Another class win in the 1965 500-miler made for a great debut, and in ’67 a pair of Thruxtons finished 1-2 in the inaugural running of the Production TT at the Isle of Man. 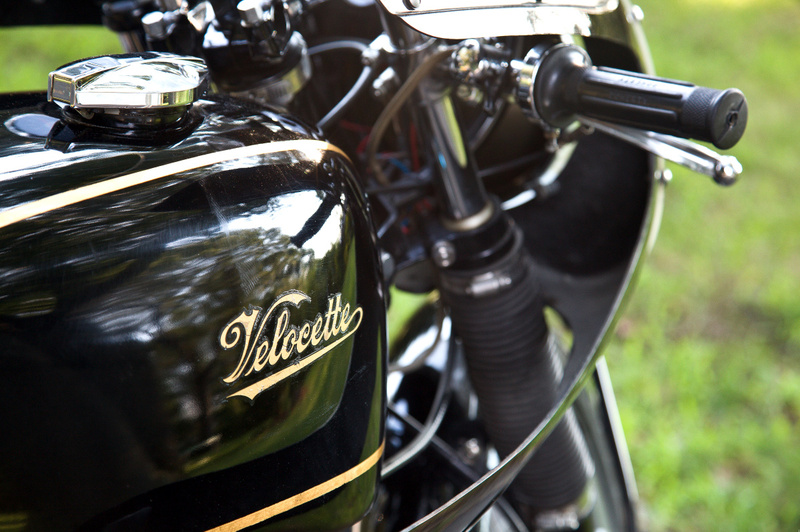 Before production ceased, Velocette made approximately 1100 Thruxtons. The Thruxton offered here is a three-owner bike imported new to the U.S. in 1969, and shows just over 10,000 miles total on its Smiths odometer. It wears an iconic, bullet-shaped Avon sports faring, a desirable factory option. 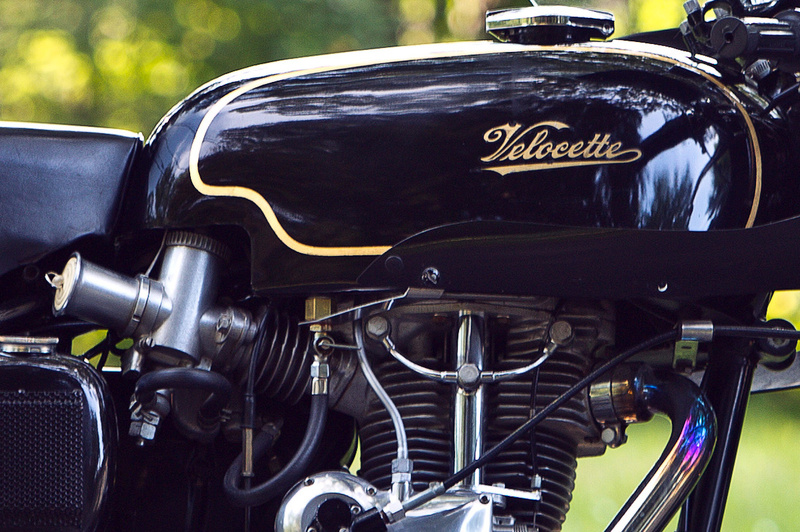 The current owner, a brand enthusiast with almost four decades of experience owning and restoring Velocettes, purchased the bike in pieces in 1986. Ten years later he undertook an exhaustive five-year frame-up restoration. Just 1100 careful miles after restoration, the bike was prepared for storage in the fall of 2007 and has not been ridden since. Included in the sale is the lower portion to the Avon fairing with brackets, an Amal Concentric carburetor in addition to the proper GP model currently fitted, and a new 6-volt battery.